From left: Billy Burns, Tommy Ladnier, Edward Cole, Arthur Briggs, Jack Carter, Noble Sissle, Rudy Jackson, Frank Etheridge, Ramon Usera, Frank "Big Boy" Goudie, Lloyd Pinckney. The personnel have been revised after printing of Traveling Blues due to new available data. This is explained more in detail in the New Findings page. A short film was made by British Pathé during the Ciro’s London engagement in December 1930. Probably filmed for a newsreel, this short clip, only two and a half minutes long, gives a unique possibility to observe Tommy Ladnier in two tunes, Little White Lies and Happy Feet. Both titles are incomplete and the second title is a vocal contribution from Jack Carter and a step dance feature for bassist Edward Cole. 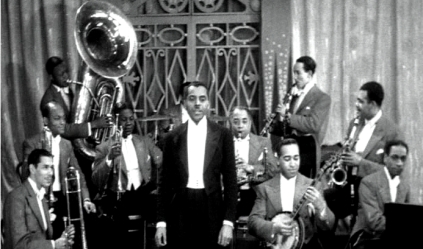 Unfortunately, Tommy has no solo in Little White Lies; the only soloists, besides Sissle, are trombonist Billy Burns and saxophonist Rudy Jackson. Billy Burns’ playing here is very fine and places this almost unknown trombonist in an elite class. Moreover, the very fine brushwork by drummer Jack Carter has to be mentioned as well as the work of the whole rhythm section. This tune is abruptly cut off just as the ensemble resumes after the trombone-sax-trombone solos and the possible Tommy Ladnier solo that might or might not have followed is never heard.